short time. Only the All American Pressure Canner features an exclusive, precision machined “Metal-to-Metal” sealing system. Positive action clamping locks align the cover to the base forming a steam tight seal. Because no gasket is involved, the cover is always easily opened and closed. 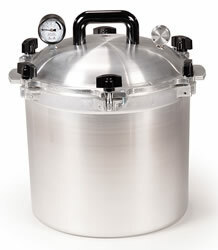 The All American Pressure Canner makes it easy to can fish, meat, vegetables, and fruits and is the only method that the U.S.D.A. recommends for low acid foods. All models feature a readable pressure gauge for accurate pressure control. canning supplies you need. From Ball Canning Jars and Ball Canning Supplies to Universal & Weston Food & Meat Choppers to specialty items such as Fruit Peelers and Pea Shellers, we offer a wide range of canning supplies and equipment. We also carry the full line of All American Pressure Canner & All American Can Sealer for home canning and can sealing. Get all your food preservation supplies from us today.